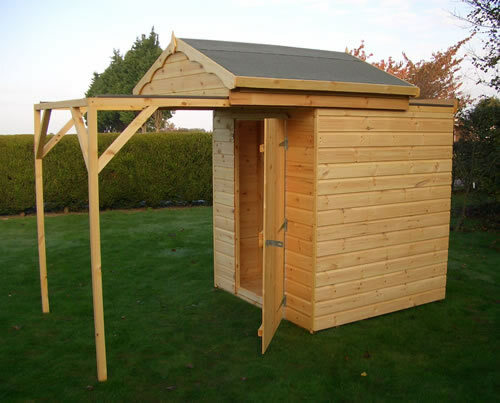 A roll on, roll off roof observatory shed in an Apex configuration. 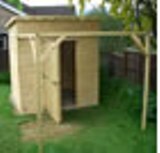 Manufactured from 22mm T&G cladding on a heavy duty frame which we use as standard on all our sheds. The roof here is shown rolling off to the front but equally can be configured to roll on and off to the side or rear. An internal floor is also supplied with this with an area for a pillar telescope to be mounted. Heavy duty framing of 2"x2" (50 x 50mm) throughout. The timber is high grade and is planed smooth. Clad in 22mm 5th Grade matching Tongue and Grooved, well seasoned Swedish red wood pine to ensure relatively knot free boards. An option of tanalisation is available. The boards are secured to the framing by high quality galvanised nails. Roofs are manufactured from 12mm tongue and groove boards of the same quality as our cladding. Our roofs are then covered with 20kg green roofing felt as standard however a higher quality, heavy duty felt is available as are felt tiles. Roofs can even be adapted to take heavier coverings such as clay pan tiles. Floors: Are of 12mm tongue and groove boarding as standard. A 22mm Board is available if required for extra durability. The floor is supported on close centred 2"x1½" (50 x 38mm) rough sawn pressure treated floor joists.